A new Mega-Map highlights gaps in evidence and aims to inspire a broader conversation around child well-being, helping to achieve UNICEF’s latest Strategic Plan. (25 June 2018) Despite a considerable reduction in child mortality, nearly six million children under the age of five die each year. Millions more are poorly nourished and in many parts of the world, the quality of education remains poor. Children are at risk from multiple violations of their rights, including child labour, early marriage, and sexual exploitation. Research plays a crucial role in helping to close the remaining gaps in child well-being, yet the global evidence base for effective interventions to meet these challenges is mostly weak, scattered and often unusable by policymakers and practitioners. Responding to the need for a more evidence-informed approach, a new Mega-Map, created by the Campbell Collaboration and co-funded by UNICEF Innocenti, encourages the generation and use of rigorous evidence on effective ways to improve child well-being for policy and programming. 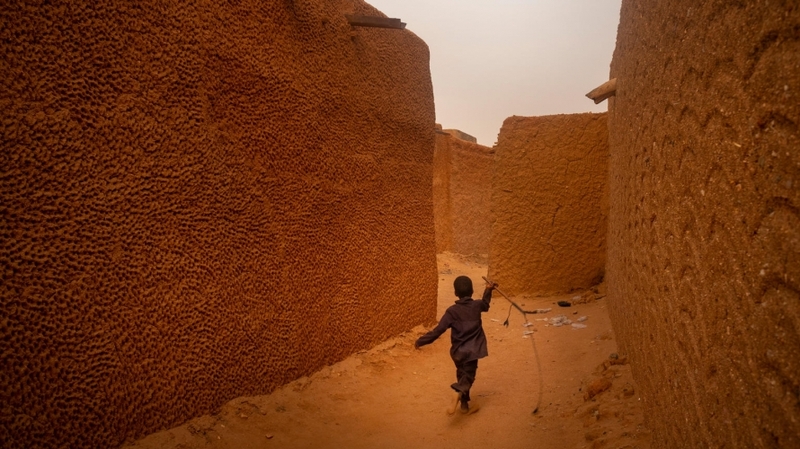 A child runs down an ancient path behind the Grand Mosque in Agadez, Niger. An evidence gap map alone, however, is insufficient to address the complex issues that remain. There is a concurrent urgent need to improve coordination among those interested in evidence-informed decision-making for children. An ‘Evidence for Children’ Roundtable in New York aims to ignite a conversation addressing this need, while the open source Mega-Map, launched at the Roundtable, will continue to facilitate collaboration among key stakeholders, long after the event. Mapping both systematic reviews and pre-existing gap maps, the Mega-Map provides an interactive overview of evidence that has already been synthesized. This creates a more balanced view and helps remove any potential bias derived from single studies. The Mega-Map identifies areas where there is ample evidence to guide policy and practice, and where there are gaps in the evidence base. What’s more, the tool is mapped against the five key goals of the latest UNICEF Strategic Plan 2018-2021, making it particularly relevant for the organization, providing accessible evidence which can be used to inform programming and policy-making. "There is a lot of work to be done, both in synthesizing existing evidence and in generating new evidence to fill the remaining knowledge gaps." 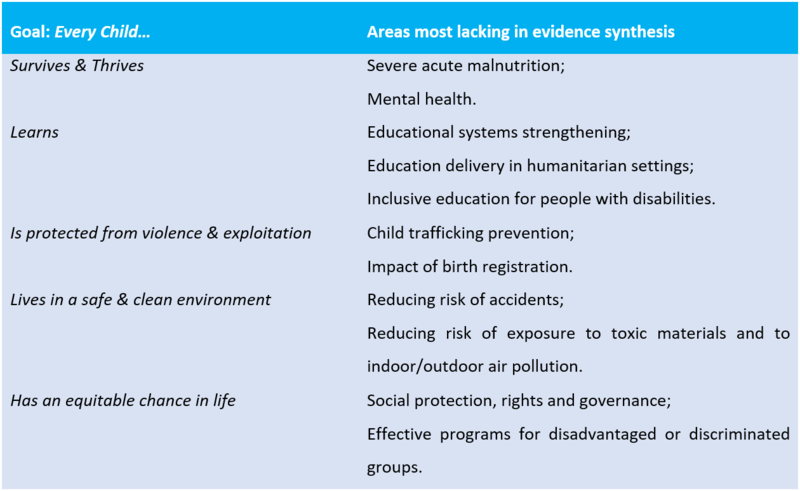 UNICEF Innocenti’s Chief of Research Facilitation & Knowledge Management, Kerry Albright, gave us an insight into some of the areas where evidence synthesis is most lacking, presented in the table below. Commenting on the results, Kerry says “there is a lot of work to be done, both in synthesizing existing evidence and in generating new evidence to fill the remaining knowledge gaps.” However, she reminds us that the Mega-Map looks only at evidence synthesis, so while there may not be any systematic reviews or other forms of synthesis, it is still possible that primary studies exist in these areas. The findings of the Mega-Map will help guide a broader conversation around child well-being at the ‘Evidence for Children’ event. Thanks to a varied audience - with representatives from development NGOs, the academic community, and UN staff - the Roundtable will facilitate discussions on evidence-informed decision-making, and the challenges involved with using evidence to inform policy and practice. The event also provides an opportunity to improve coordination among those with an interest in evidence for children, helping to ensure more efficient use of resources, preventing duplication of effort and ensuring high quality standards in reviews. A small section of the Mega-Map on Child Well-Being. Synthesizing evidence is a continuous process. The Roundtable will be followed with five Research Briefs relating to each of the goals of UNICEF’s Strategic Plan 2018-2021, as well as exploring an ongoing process for better review coordination. This constantly ‘in-flux’ nature of evidence generation and synthesis is perhaps best represented by one of the most useful features of the Mega-Map: it will be a ‘living map’. Thanks to the Bill and Melinda Gates Foundation, the map will be updated at least annually over the lifetime of the Strategic Plan and will be freely accessible to all, ensuring its relevance and utility to help improve child well-being for many years to come. In this podcast, hear Kerry Albright explain how the Mega-Map was created, where the biggest evidence gaps lie, and what she thinks is needed in order to close these gaps and improve child well-being all over the world. Explore the Mega-Map on Child Well-Being here. Links will be provided to the subsequent Research Briefs once available. The Mega-Map is being launched at an 'Evidence for Children' Roundtable in New York on 27 and 28 June 2018. You can sign up for the event here. 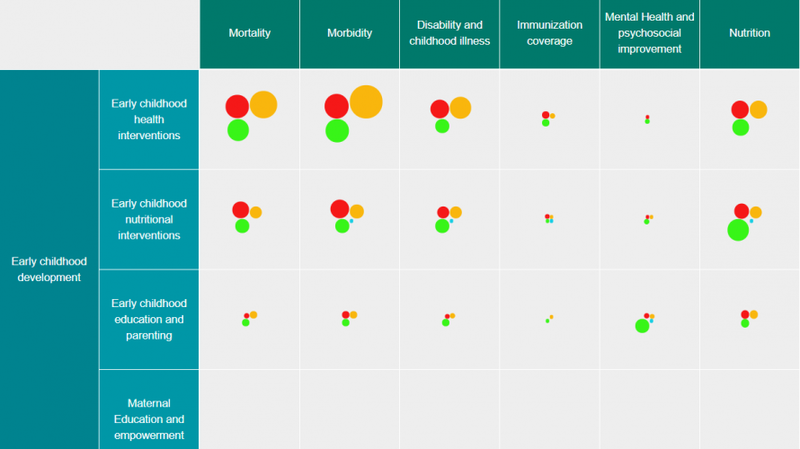 This evidence gap map (EGM) collates the evidence base for adolescent interventions in low- and middle-income countries (LMICs), with a focus on the outcome domains of protection, participation and financial and material well-being. Outcomes relating to the enabling environment for adolescents are also included to capture the contextual influences that might affect the well-being of adolescents. The EGM contains 74 studies (71 impact evaluations and 3 systematic reviews) of evaluated interventions targeting adolescents in LMICs. Most of the evidence is on financial support to individuals and households, where interventions predominantly include conditional cash transfers, and studies frequently evaluate their impacts on child labour and child marriage outcomes. The second largest evidence cluster relates to the impacts of socio-emotional learning and life skills on adolescent protection, particularly protection-related attitudes, skills and knowledge, while psychosocial support is the third most frequently appearing intervention. At the group and community level, the largest bodies of evidence are on financial literacy and savings schemes, and norm change interventions. The largest evidence gaps are at the policy and institutional level, the enabling environment for adolescent well-being, and the use of and access to information and communication technology (ICT) by adolescents. While coverage of gender is prominent in the literature, only one intervention specifically targets boys and men to promote attitudes towards gender equity. Recommendations for future primary research and synthesis are made. The interactive EGM is available online at www.unicef-irc.org/evidence-gap-map.